I have now finished my third reading of The Gateway Chronicles and I loved it just as much as the first time I read it. I kind of dreaded reading The Bone Whistle partly because it would mean the end of the series. But I also dreaded the deterioration of the relationship between Darcy and her family. First, I want to take a look at the covers of the series. When I first saw the covers of The Six and The Oracle (read my review), I was on the fence about the simplistic design. If you know me, you know I like pretty covers. I appreciate the cover as one would a piece of art. I'm often drawn to a book because of its cover even when the book isn't something I would ever read. So while I missed the eye-catching aspect, I was drawn to this clean, unassuming cover. Then The White Thread (read my review) came out and I really liked the smoke while keeping with the simple design. But it was really The Enchanted (read my review) that caught my eye. It was like a flower was floating on water. Then I was back to being lukewarm with the cover of The Scroll (read my review). I loved the previous edition's cover. The red was so eye-catching and then there was this life-like dragon. At first, I thought it was because of the contrast between the two covers. But something about this particular cover bothered me, to the point I couldn't stop thinking about it. So next, I thought it was the added color making it feel separate from the other covers in this edition of the series. But then The Bone Whistle came out and I realized that wasn't it. Now I think it is just that particular graphic that I don't like. 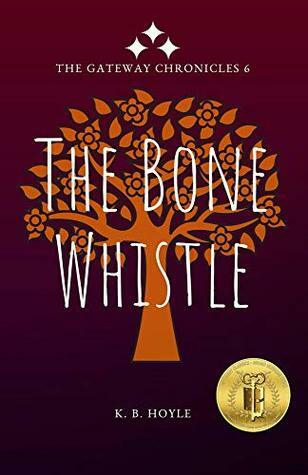 And The Bone Whistle's cover? I LOVE IT! I think it is my favorite of this edition of the series. I find it eye-catching while keeping to the simplicity of the series' covers. If you haven't read The Bone Whistle, this book needs a major tissue warning. I knew what was going to happen and I thought I was prepared, but then I found myself bawling so hard that the words on the page blurred and I had to stop reading until I could calm down (I had a few false starts as I would start cry as soon I picked up the book again). There was just something about the following line from Lewis that kills me. "I just want to make sure you had what you need before I leave." There is so much emotion and meaning packed into that one simple line. Lewis is a quiet character. Because of that, he sees and understands so much more about what is going on than any of the other characters. Sam wanted to be Darcy's friend and it seemed that Lewis was just going along because he was Sam's friend. But I really feel like Lewis is Darcy's guy. You know, the one that is always there for her. He might not always like her (especially when she hurt Sam), he was still there to assist her. He took up running for Darcy and it was Lewis who punched Colin (not Perry or even Dean, who were more likely characters for physical confrontation) in defense of Darcy. As I said it my first review of The Bone Whistle, it is "full of action and totally captivating as the previous 5 books in the series". I may have read through this book faster than the previous ones, even though I think it is still the longest in the series. My only real dissatisfaction with the book happens right at the beginning so it is quickly forgotten when you get to all the beautiful prose as we say goodbye to the characters one by one. I have never liked how things are left between Darcy and her parents. We know that Darcy hasn't had the greatest relationship with her mother throughout the series, but she and her father were close. But even that relationship falls apart at the beginning of this novel. I guess for kids who don't have a great home life, maybe it gives them hope that they can move on from it and have a great and meaningful life. But at the same time, I hope teens don't think they have to break all ties with their family to achieve independence. In Darcy's case, it is more than just breaking the ties of childhood, it is a broken relationship and that greatly saddens me. It is probably because I'm currently reading Putting the Science in Fiction that the way mental illness is brought into the story bugs me more so than it has in the past. I don't want teens who may need help to feel that they can't go to their parents or fear that they will immediately be labeled crazy and put on medication and under house arrest. A doctor would never diagnosis a person or prescribe a course of treatment without speaking to the person first. And with the "symptoms" Darcy is exhibiting all medical illnesses would need to be ruled out first. It is more likely that she has a brain tumor producing the "hallucinations" instead of schizophrenia. In the previous edition, there is a scene where Darcy does go to the doctor. While the reader did not need the details of that scene, it may have been more realistic to have at least mentioned that all physical illnesses had been ruled out. Also, it is probably more likely she has a form of depression, bipolar disorder, or borderline personality disorder given her "symptoms". Schizophrenia is pretty rare and doesn't usually present itself in women until their late twenties. Now I get that Hoyle needed some plot device to lock Darcy in her house. But couldn't she just have been grounded? Or her parents insisting she speak with a trained professional and taking her keys and phone to make sure she went to the appointment the next day would have been more realistic I think. Though perhaps not as dramatic. Seriously, though The Bone Whistle is a terrific conclusion to this great series that has a wonderful message about friendship, loyalty, love, and redemption. I think it is a must read for all ages.